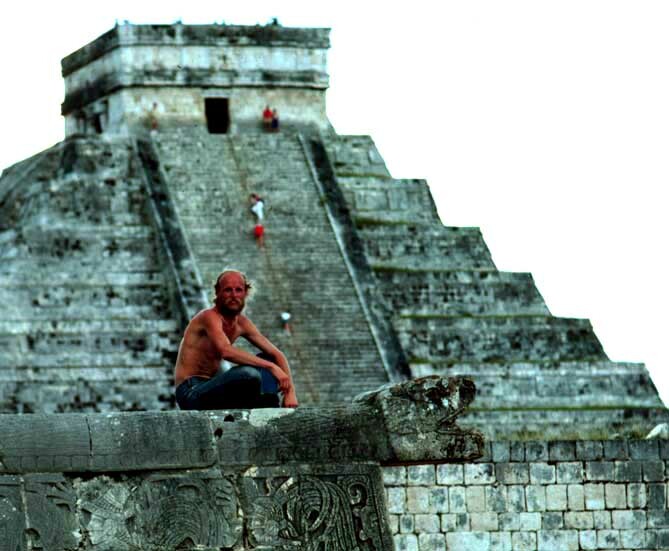 The Mayan Ruins at Chichen Itza, a Photo Gallery. Above. 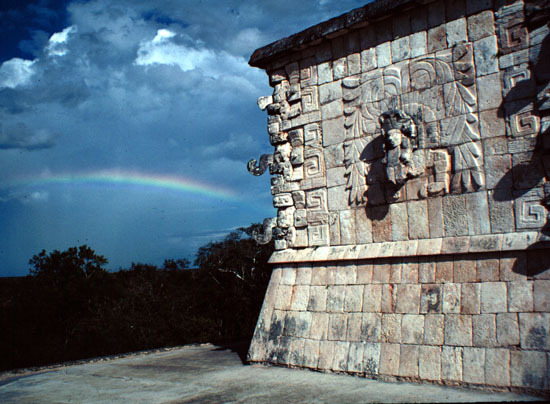 A rainbow seemingly emanates from the chac masks on a corner of the Temple of the Columns. 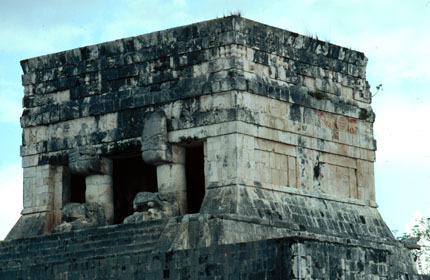 The images present views of Chichen Itza, a Mayan archaeological site in Yucatan, Mexico. 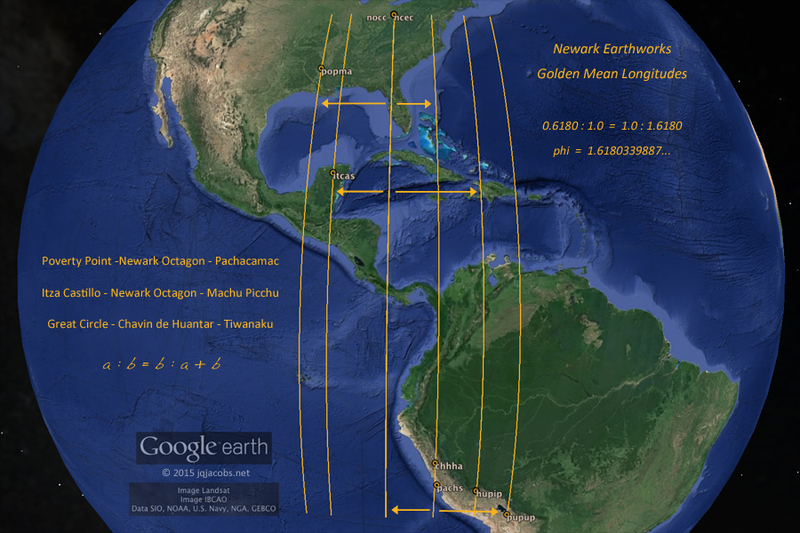 Each thumbnail photo is a link to a larger version of the same photograph. 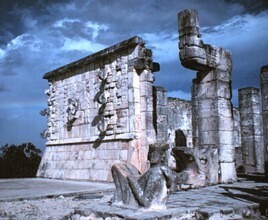 A Chac Mool statue faces the main plaza and the Castillo pyramid from the centerline of the doorway atop the Temple of the Columns platform. A section of the main doorway beam remains in the socket atop the wall above the Chac Mool. The Temple of the Columns is so named for the many columns in the foreground and to the right of the platform. The columns probably supported a roof. 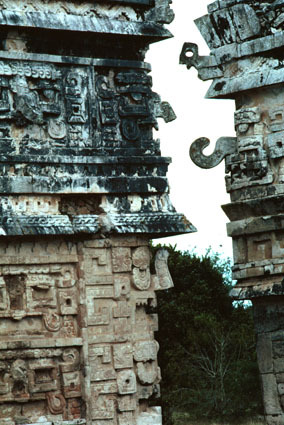 In the main doorway two serpent columns supported a large wooden beam. 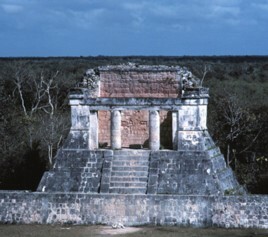 The interior of the structure at the northern end of the Ballcourt is sculpted in bas relief. Red paint remains. 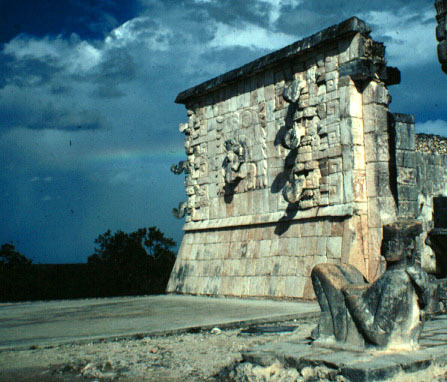 Viewing from the Temple of the Jaguars (right), the very level horizon, a distinct aspect of Chichen Itza's location, is seen. Perched high above the Ballcourt this double serpent column doorway faces the Ballcourt. High walls with a projecting stone ring line the two long sides of the Ballcourt. This building is atop the east side of the Ballcourt and faces away from the main plaza and the Castillo. 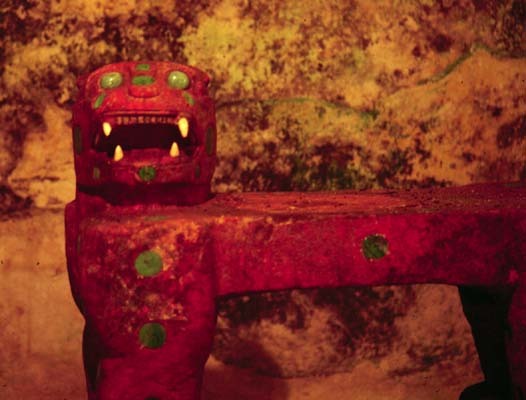 A close-up view of the 'jaguar mool' inside the Castillo. Note the jade eyes. Perhaps these treasures are why the guards chased me out of the ruins at sunrise! 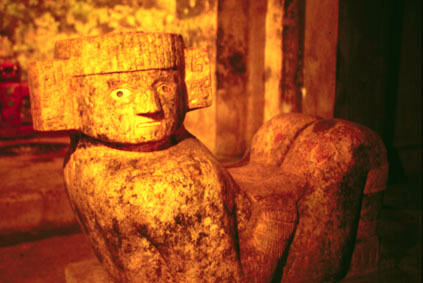 Another Chac Mool statue has been found within the Castillo pyramid. The present version of the Castillo sits atop an earlier pyramid. 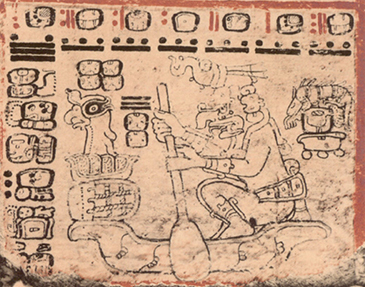 This Chac Mool and the jaguar statue in the background are located on top of the previous pyramid. Excavators have created a tunnel up the original stairs and under the present stairs, seen in the next row. A jaguar mool close-up follows below. 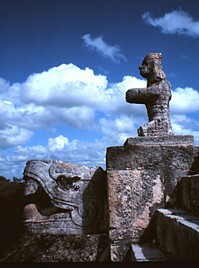 This giant serpent's head decorates the base of the Castillo stairway. 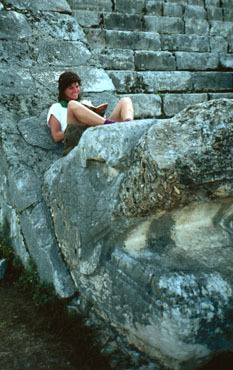 A view of the author (in 1983) astride the Ballcourt's wall with the Castillo in the background. 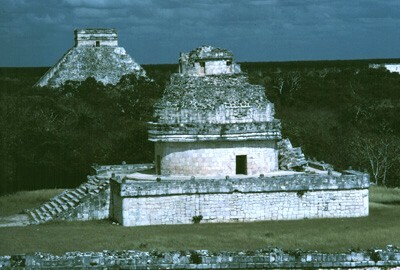 View of the Caracol in the foreground, the Castillo dominating the left background and the Temple of the Column on the far right. This view was taken from atop one of the Nunnery buildings. 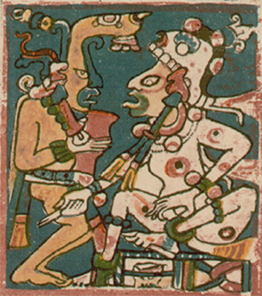 in the Ballcourt and Castillo area. 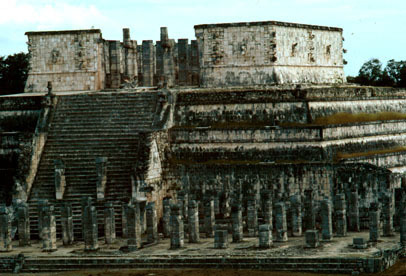 "Que estos edificios de Izamal eran ... por todos sin haber memoria de los fundadores ... Que los segundos edificios mas principales son los de Tikoch y Chicheniza ... Que Chicheniza es un asiento muy bueno a diez leguas de Izamal y once de Valladolid, donde dicen que reinaron tres señores hermanos que vinieron a aquella tierra de la parte poniente, los cuales eran muy religiosos y que asi edificaron muy lindos templos. Y que vivieron sin mujeres muy honestamente, y que el uno de estos se murió o se fue, por lo cuallos otros se hicieron parciales y deshonestos, y que por ello los mataron. ... "
How many ancestors do we have? One day I started to count them. I was not prepared for the answer or its implications.